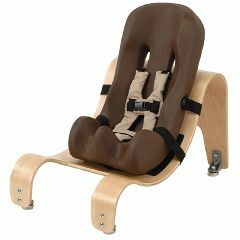 AllegroMedical.com presents The Special Tomato® Soft-Touch™ Sitter Seat - Seat And Stationary Base - Size 3. The Special Tomato® adaptive seating systems are available in various sizes, colors and modular offerings. Special Tomato® offers the Soft-Touch™ Sitter in several sizes and configurations. The Soft-Touch™ Sitter with Tilt Wedge was created to provide proper seating posture to children with mild to moderate physical involvement. By adding the Tilt Wedge Base, a child can get down to peer level. This stationary base is a wooden base that has been weight tested to hold a child aged 6-9 years old and 40-80 lbs with the size 3 Sitter attached. Weight capacity: 40-80 lbs.